No, we still don't know what it's made of, and Xi3 CEO Sullivan isn't about to say. "Unfortunately, I can't tell you what I know is coming because it's not time to tell you," says Jason A. Sullivan, CEO of Piston-making Xi3. "But I will say this: the bar has been raised." The Piston, not quite a Steam box, will be on shelves by November 29th - or in your hands November 15th if you pre-ordered - but if you want a closer look and happen to be in New York right about now, it will be getting a preview at the Interop New York Trade show this week. Booth #401, Wednesday or Thursday, is where you want to be, assuming you haven't got an urgent engagement in, say, RD North Carolina. "Piston is smaller, lighter, and will last longer, provide more gaming options and be more powerful than any other gaming console on the planet," claims Sullivan. "The reason I feel confident in saying this is because we started with a clean slate, unlike competing manufacturers." That would include Valve, which is busy making a Steam box of its own, and when last we saw Xi3 there were some philosophical differences between the two companies, particularly over the utility of Microsoft's OS. We still don't know a lot about Piston, but the launch announcement did have some interesting tidbits, most notably that the potential memory storage capacity of the standard unit has doubled, from 128GB SSD, by adding a second SSD connector. The standard's now capable of more than 1TB solid state storage, if the owner takes advantage of the extra slot. 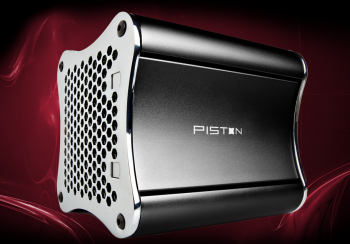 It's all part of Piston's design philosophy: upgrade as you like, when you like. The Piston will also have games pre-loaded on its system, but Sullivan's not about to tell you what, or with which developers Xi3 has made a deal. "I can't wait to get this into the hands of gamers everywhere," says Sullivan, "'cause I know they're gonna love it." We'll soon find out; November seems to be a popular month for console launches, and the Piston will face stiff competition.